The freedom of the open road is why someone purchases an RV. Unfortunately, the way things are now-a-days, you are hard pressed to find an area to park where everyone wishes to respect your RV and the freedom it provides. There are so many pieces of gear that you need to protect from theft. Most of these items are expensive like a recreational vehicle battery, a set of propane tanks, or even an electric generator. These items can fetch a heavy price in a black market and you need to protect them right now. Your RV battery needs to be locked at all times. In this video we are going to show you just how quick and easy it is for thug off the streets to steal your expensive battery. You will see first hand that the lack of an RV battery lock for your vehicle will coincidentally result in someone taking what you work hard for. Our CEO, Bob Beatty, takes a very simple set of tools to his neighbor’s rig and within 30 seconds has the battery off and ready to run with. If this isn’t proof that you need a preventive measure protecting your valuables, we don’t know what is. Coincidentally, 30 seconds is the same amount of time it takes to install your Batteryshackle RV battery lock. The setup is so easy that you can do it without any tools. Simply put three pieces of solid steel in place, including the center locking bar, and lock with three pad locks. It is a simple but effective design that works like a charm. In this video, Bob shows you just what we are talking about in just over 30 seconds. Right now our company hand welds each rv battery lock out of pure steel. 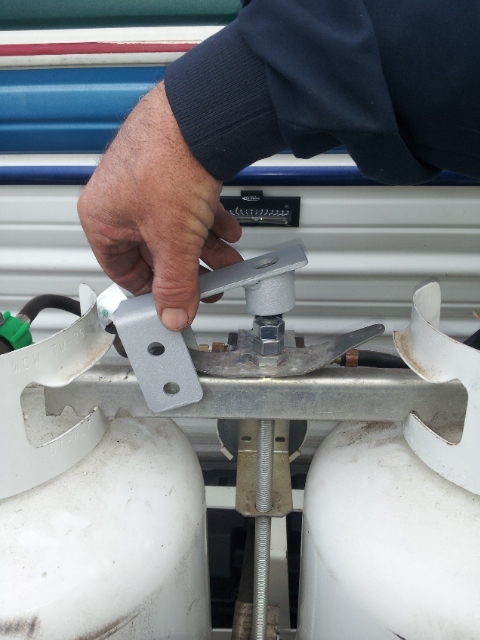 Our RV battery lock is not a flimsy piece of plastic. A thief will have a very hard time stealing your valuables. In fact, it would involve a very specific set of tools to destroy our lock, which causes way too much effort to get to an RV battery. Basically, with Batteryshackle, you are safe from theft, period. Our competitors try to promise this, and they just can’t because their lock is not a quality product. Please, don’t waste your money with their inferior product as many of our customers were previous customers of theirs. This entry was posted in RV Battery Lock on July 27, 2015 by Optimize Worldwide.